COMPANY PROFILE EnQuest PLC is an independent producer of oil and gas in the UK North Sea. The principal activities of the company and its subsidiaries are the exploration for, and extraction and production of, hydrocarbons in the UK Continental Shelf and Malaysia. EnQuest PLC is one of the largest UK independent producers of oil and gas in the UK North Sea. The principal activities of the company and its subsidiaries are the exploration for, and extraction and production of, hydrocarbons in the UK Continental Shelf and Malaysia. It focuses on maturing assets and undeveloped oil fields. Its geographical segments include the North Sea and Malaysia. The firms United Kingdom assets include its interests in the producing operated oil fields Heather/Broom, Thistle/Deveron, the Dons area, the Greater Kittiwake Area and Alma/Galia, also in the Kraken and Scolty/Crathes developments. It also has a non-operating interest in the producing Alba oil field. 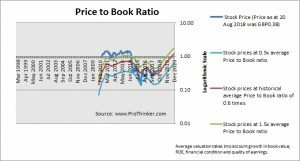 At the price of GBP0.38 as at 20 Aug 2018, Enquest Plc is trading at a Price to Book Ratio of 0.7 times current book value. 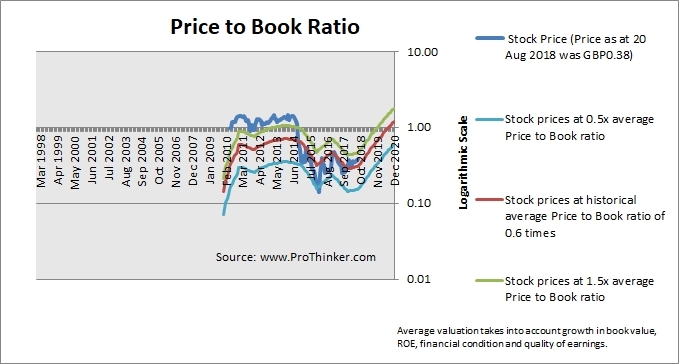 This is a 24% premium to its historical average Price to Book Ratio of 0.6 times.